Another great tasting quick bread. Easy to make as ingredients are simple and always available at home. 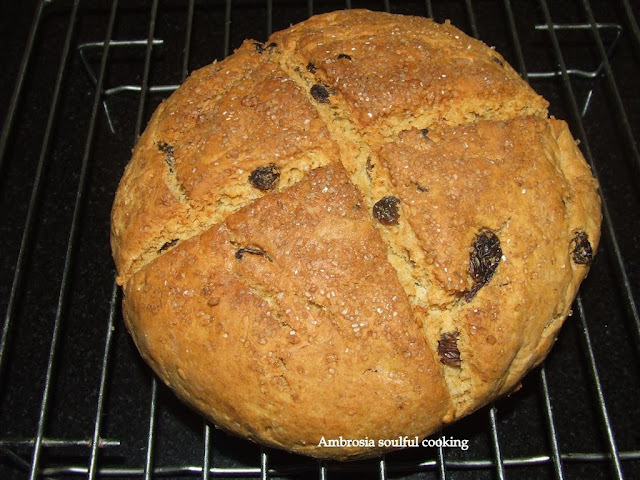 Raisins add natural sweetness to this bread. I make it very often. It comes in handy when kids are hungry at odd hours. Tastes great with butter or just plain. Irish bread is also convenient to take along in journeys. It is non- messy and filling. Sieve together all purpose flour, wheat flour, salt, baking powder and baking soda. Add olive oil and mix evenly. Now add a little buttermilk and mix dry ingredients. Add buttermilk gradually and knead well. Once soft dough is obtained, add raisins and knead again. Shape the dough into a round ball and make a cross in the centre. Sprinkle one tablespoon sugar on top. Transfer it to a greased baking tray. Bake in a pre heated oven at 180 degrees for about 40 minutes. Once done, let it sit in the oven for 10 minutes. Thereafter transfer it to wire rack to cool. If you liked this recipe and tried it, do leave a comment. i would love to hear from you! I tried it today.. it came out lovely.. my family loved it.